Unfortunately, Lacaze could provide no information on the glaring issue outside the company’s control that imperils its future: the regulatory cloud around the 450,000 tonnes of radioactive waste produced by its Malaysian operations since 2013, which is jeopardising the renewal of its licence to operate in the country. …..
the company was still “seeking clarification” on comments earlier this month by Malaysian Prime Minister Mahathir Mohamad, which appeared to solve the problem of the licence pre-condition that Lynas says it cannot meet – removal of the radioactive waste by September 2. Mahathir said Lynas – or any potential acquirer (without explicitly naming Lynas’ estranged suitor, Wesfarmers, whose $1.5 billion indicative offer for the group was rebuffed in March) – would be able to continue to operate in Malaysia if it agreed to extract the radioactive residue from its ore before it reached the country. Despite two cabinet meetings since that announcement, Mahathir has failed to clarify his comments, or confirm whether it means Lynas might not need to move the existing mountain of radioactive waste that has been accumulating at its $1 billion, 100-hectare processing facility in Kuantan province. It was the only update that mattered, and the continuing silence has not helped its cause. The PM’s comments – which have mired Wesfarmers in controversy over what exactly its chief executive, Rob Scott, said to Mahathir in a meeting ahead of this statement – hinted at a path Lynas could have taken instead of processing its ore in Malaysia. Lynas’ crown jewel is its world-class rare earths deposit in Mt Weld, Western Australia. Lynas initially planned to process the ore near its WA mine but was attracted by the infrastructure in Kuantan, including water, electricity, chemical and gas supplies, a skilled labour force and proximity to its customers in the region. The eventual decision to set up its processing plant in Malaysia meant Lynas also exported the controversy over what happens to the toxic waste produced by the extraction process. And as the water-leached purification (WLP) residue – which contains low-level radioactive waste – has accumulated since production started in 2013, so has the push-back. It reached its nadir in December last year when the Malaysian government made the export of the radioactive waste a pre-condition of its licence being renewed beyond September. The Malaysian PM would be well aware that the implications of closing the rare earth processing plant extend well beyond Malaysia and Australia. There are significant global concerns about the fact that China dominates the supply of rare earths – a group of 17 elements crucial to the manufacture of hi-tech products like digital cars, smart phones and wind turbines. Lynas is the only significant miner and processor of rare earths outside China. Not that this means anything in Malaysia, where there has been no end to the negative news that has dogged the Lynas operations since it set foot in the country. 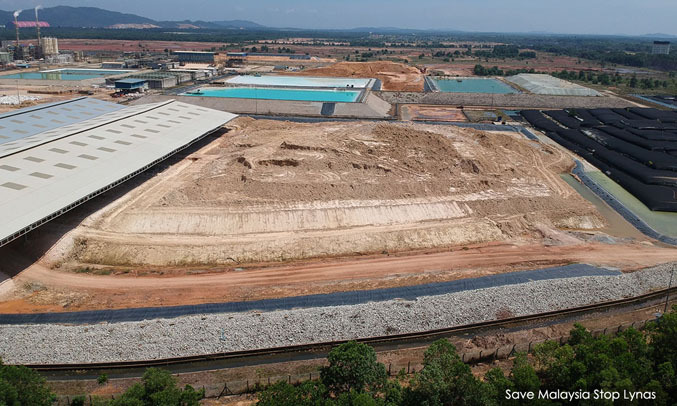 Lynas was just this week forced to deny fresh allegations it had breached Malaysian environmental regulations by storing more than 1.5 million tonnes of waste on-site for years. The worry for Lynas is that the latest complaint, by Malaysian MP Lee Chean Ching, related to the 1.13 million tonnes of non-toxic waste produced by its operations, not the 450,000 tonnes of radioactive waste. The Sydney Morning Herald and The Age also revealed this week that Lynas was warned in a confidential 2011 report, by crisis management group Futureye, that there was an “urgent need” for it to win the local community’s support. The report presciently warned that its operations in the country could be jeopardised if it did not change the way it dealt with environmental concerns and the government. …. Malaysian concerns around rare earth processing pre-date Lynas. Private firms jolted by beach sand mining ban, Times of India M K Ananth , 24 Feb 19, MADURAI: Environmentalists fighting against rampant illegal sand mining have hailed the gazette notification by the Union ministry of mines changing the rules that earlier allowed private companies to mine rare earth minerals found on beach sand. They said the notification was much awaited and would help save the coastal treasures. Activist Lal Mohan of Kanyakumari said rampant mining by private players had led to erosion of the shores and many sand dunes that acted as barriers during natural disasters such as tsunami had disappeared. He accused private players of influencing officials and exploiting coastal minerals and exporting monazite. the millions in subsidies thorium will require to become commercially viable would be better spent on solar, wind and other alternative energy sources. Is thorium the great hope for a clean, viable and safe nuclear-fuel alternative to uranium, or is it an impractical and overly expensive option that could never be adopted by the nuclear industry? Nuclear energy has numerous advantages, but there are drawbacks as well: nuclear waste poses a significant environmental threat, meltdowns are a possibility and nuclear materials can be used to create weapons of mass destruction. If it’s so great, why aren’t we using it? When nuclear power was being developed in the 1950s, it was part of a broader Cold War strategy. Governments were paying for the research and it was in their interest to develop uranium as the primary nuclear fuel because it could also be used in weapons development. However, critics of the thorium alternative point out that it’s more expensive than uranium because it can’t sustain a reaction by itself and must be bombarded with neutrons. Uranium can be left alone in a reaction, while thorium must be constantly prodded to keep reacting. Although this allows for safer reactions (if the power goes out it simply deactivates), it’s a more expensive process. Thorium is a popular academic alternative: in the lab it works well, but it hasn’t been successfully — or profitably — used on a commercial scale yet. Current Usage of ThoriumIndia is the market leader in trying to harness thorium for the energy grid. It has the largest proven thorium reserves and the world’s only operating thorium reactor, Kakrapar-1, a converted conventional pressurized water reactor. China is working to develop the technology as well, while the United States, France and Britain are studying its viability. Flibe Energy, which is based in Huntsville, Alabama, recently noted the company is looking to establish a liquid fluoride thorium reactor in the U.S. within the next decade, with Wyoming as a possible location. Proponents of renewable energy concede that thorium is preferable to uranium, but argue that the millions in subsidies thorium will require to become commercially viable would be better spent on solar, wind and other alternative energy sources. While nuclear advocates are more hospitable to thorium, they are hesitant to put all their eggs in one basket at this point. The element hasn’t shown itself to be feasible as a profitable commercial energy source, whereas uranium has. Despite a history of reactor meltdowns and near-meltdowns, there’s a renewed emphasis on nuclear power in the world today, and nuclear industry advocates don’t see now as the time to try an unproven alternative. The bottom line is that when it comes to thorium versus uranium, thorium is more abundant, as well as cleaner and safer, but given current capabilities, it produces more expensive energy than uranium and still leads to environmental waste issues. The safety issue is also not resolved, as stated above: pressurized water leaking from the steam generator into the hot, radioactive molten salt will explosively turn to steam and cause incredible damage. The chances are great that the radioactive molten salt would be discharged out of the reactor system and create more than havoc. Finally, controlling the reaction and power output, finding materials that last safely for 3 or 4 decades, and consuming vast quantities of cooling water are all serious problems. The greatest problem, though, is likely the scale-up by a factor of 500 to 1, from the tiny project at ORNL to a full-scale commercial plant with 3500 MWth output. Perhaps these technical problems can be overcome, but why would anyone bother to try, knowing in advance that the MSR plant will be uneconomic due to huge construction costs and operating costs, plus will explode and rain radioactive molten salt when (not if) the steam generator tubes leak. Preface This article, number 28 in the series, discusses nuclear power via a thorium molten-salt reactor (MSR) process. (Note, this is also sometimes referred to as LFTR, for Liquid Fluoride Thorium Reactor) The thorium MSR is frequently trotted out by nuclear power advocates, whenever the numerous drawbacks to uranium fission reactors are mentioned. To this point in the TANP series, uranium fission, via PWR or BWR, has been the focus. Some critics of TANP have already stated that thorium solves all of those problems and therefore should be vigorously pursued. Some of the critics have stated that Sowell obviously has never heard of thorium reactors. Quite the contrary, I am familiar with the process and have serious reservations about the numerous problems with thorium MSR. The half-lives of the protactinium isotopes work in the favor of potential proliferators. Because protactinium 232 decays faster than protactinium 233, the isotopic purity of protactinium 233 increases as time passes. If it is separated from its uranium decay products a second time, this protactinium will decay to equally pure uranium 233 over the next few months. With careful attention to the relevant radiochemistry, separation of protactinium from the uranium in spent thorium fuel has the potential to generate uranium 233 with very low concentrations of uranium 232—a product suitable for making nuclear weapons. Thorium power has a protactinium problem https://thebulletin.org/2018/08/thorium-power-has-a-protactinium-problem/ By Eva C. Uribe, August 6, 2018 In 1980, the International Atomic Energy Agency (IAEA) observed that protactinium, a chemical element generated in thorium reactors, could be separated and allowed to decay to isotopically pure uranium 233—suitable material for making nuclear weapons. The IAEA report, titled “Advanced Fuel Cycle and Reactor Concepts,” concluded that the proliferation resistance of thorium fuel cycles “would be equivalent to” the uranium/plutonium fuel cycles of conventional civilian nuclear reactors, assuming both included spent fuel reprocessing to isolate fissile material. Decades later, the story changed. “Th[orium]-based fuels and fuel cycles have intrinsic proliferation resistance,” according to the IAEA in 2005. Mainstream media have repeated this view ever since, often without caveat. Several scholars have recognized the inherent proliferation risk of protactinium separations in the thorium fuel cycle, but the perception that thorium reactors cannot be used to make weapons persists. While technology has advanced, the fundamental radiochemistry that governs nuclear fuel reprocessing remains unchanged. Thus, this shift in perspective is puzzling and reflects a failure to recognize the importance of protactinium radiochemistry in thorium fuel cycles. Protactinium turns 100. The importance of protactinium chemistry for obtaining highly attractive fissile material from thorium has been recognized since the 1940s. However, the story really begins 100 years ago during the earliest research on natural radioactivity. In 1918, Austrian-Swedish physicist Lise Meitner and German chemist Otto Hahn were on a quest to discover the long-lived isotope of “eka-tantalum” predicted to lie between thorium and uranium in the periodic table. The isotope they sought would decay to actinium, which was always found with uranium but was known to be the parent of an unknown natural radioactive decay chain distinct from that of uranium 238, the most common isotope of uranium found in nature. Meitner and Hahn discovered that treating pitchblende with nitric acid yielded an insoluble fraction of silica that associated with tantalum and eka-tantalum. After many years, they purified enough eka-tantalum for identification and measured its properties. As discoverers of eka-tantalum’s longest-lived isotope, Meitner and Hahn named this new element protactinium. They had isolated protactinium 231, a member of the uranium 235 decay chain. In 1938, they discovered that protactinium 233 could be produced by neutron irradiation of thorium 232, the most abundant isotope in naturally occurring thorium. For the next several decades, protactinium was shrouded in “mystery and witchcraft” due to its scarcity in nature and its perplexing chemical properties. We now know that protactinium’s peculiar chemistry is due to its position in the periodic table, which lends the element vastly different chemical properties than its neighbors. Protactinium behaves so differently from thorium and uranium that, under many conditions, their separation is inevitable. Scientists did not investigate the macroscopic chemistry of protactinium until the Manhattan Project. In 1942, Glenn T. Seaborg, John W. Gofman, and R. W. Stoughton discovered uranium 233 and observed its propensity to fission. Compared with naturally occurring uranium 235, uranium 233 has a lower critical mass, which means that less material can be used to build a weapon. And compared with weapons-grade plutonium 239, uranium 233 has a much lower spontaneous fission rate, enabling simpler weapons that are more easily constructed. A 1951 report by the Manhattan Project Technical Section describes extensive efforts devoted to the production of uranium 233 via neutron irradiation of thorium 232. Because the initial thorium feed material was often contaminated with natural uranium 238, the scientists obtained pure uranium 233 by using a variety of methods for separating the intermediate protactinium 233. By this time, advances in technology and projections of uranium shortages stimulated interest in developing a breeder reactor, which produces more fissile material than it consumes. In the late 1960s, a team at Oak Ridge National Laboratory designed a Molten Salt Breeder Reactor fueled by thorium and uranium dissolved in fluoride salts, but it could only breed uranium 233 by continuously removing impurities—including protactinium 233—from the reactor core. To improve breeding ratios, the researchers investigated methodsfor removing protactinium from the molten fluoride salts. In 1977, President Jimmy Carter banned commercial reprocessing of spent nuclear fuel, citing concerns with the proliferation of technology that could be used to make nuclear weapons. And with the high startup costs of developing new reactors, there would be no place for the Molten Salt Breeder Reactor in the energy market. With the end of research on thorium reactors came the end of ambitious research on protactinium separations. Over time, the role of protactinium in obtaining weaponizable uranium 233 from thorium was largely forgotten or dismissed by the thorium community. Thorium reactors born again. Fast forward to 2018. Several nations have explored thorium power for their nuclear energy portfolios. Foremost among these is India. Plagued by perennial uranium shortages, but possessing abundant thorium resources, India is highly motivated to develop thorium reactors that can breed uranium 233. India now operates the only reactor fueled by uranium 233, the Kalpakkam Mini reactor (better known as KAMINI). Thorium reactors have other potential advantages. They could produce fewer long-lived radioactive isotopes than conventional nuclear reactors, simplifying the disposal of nuclear waste. Molten salt reactors offer potential improvements in reactor safety. Additionally, there is the persistent perception that thorium reactors are intrinsically proliferation-resistant. The uranium 233 produced in thorium reactors is contaminated with uranium 232, which is produced through several different neutron absorption pathways. Uranium 232 has a half-life of 68.9 years, and its daughter radionuclides emit intense, highly penetrating gamma rays that make the material difficult to handle. A person standing 0.5 meters from 5 kilograms of uranium 233 containing 500 parts per million of uranium 232, one year after it has been separated from the daughters of uranium 232, would receive a dose that exceeds the annual regulatory limits for radiological workers in less than an hour. Therefore, uranium 233 generated in thorium reactors is “self-protected,” as long as uranium 232 levels are high enough. However, the extent to which uranium 232 provides adequate protection against diversion of uranium 233 is debatable. Uranium 232 does not compromise the favorable fissile material properties of uranium 233, which is categorized as “highly attractive” even in the presence of high levels of uranium 232. Uranium 233 becomes even more attractive if uranium 232 can be decreased or eliminated altogether. This is where the chemistry of protactinium becomes important. Protactinium in the thorium fuel cycle. There are three isotopes of protactinium produced when thorium 232 is irradiated. Protactinium 231, 232, and 233 are produced either through thermal or fast neutron absorption reactions with various thorium, protactinium, and uranium isotopes. Protactinium 231, 232, and 233 are intermediates in the reactions that eventually form uranium 232 and uranium 233. Protactinium 232 decays to uranium 232 with a half-life of 1.3 days. Protactinium 233 decays to uranium 233 with a half-life of 27 days. Protactinium 231 is a special case: It does not directly decay to uranium, but in the presence of neutrons it can absorb a neutron and become protactinium 232. Neutron absorption reactions only occur in the presence of a neutron flux, inside or immediately surrounding the reactor core. Radioactive decay occurs whether or not neutrons are present. For irradiated thorium, the real concern lies in separating protactinium from uranium, which may already have significant levels of uranium 232. Production of protactinium 232 ceases as soon as protactinium is removed from the neutron flux, but protactinium 232 and 233 continue to decay to uranium 232 and 233, respectively. Scenarios for proliferation. Although thorium is commonly associated with molten salt reactors, it can be used in any reactor. Several types of fuel cycles enable feasible, rapid reprocessing to extract protactinium. One is aqueous reprocessing of thorium oxide “blankets” irradiated outside the core of a heavy water reactor. Many heavy water reactors include on-power fueling, which means that irradiated thorium can be removed quickly and often, without shutting the reactor down. As very little fission would occur in the blanket material, its radioactivity would be lower than that of spent fuel from the core, and it could be reprocessed immediately. Myriad possibilities exist for the aqueous separation of protactinium from thorium and uranium oxides, including the commonly proposed thorium uranium extraction (THOREX) process. Alternatively, once dissolved in acid, protactinium can simply be adsorbed onto glass or silica beads, exploiting the same chemical mechanism used by Meitner and Hahn to isolate protactinium from natural uranium a century ago. 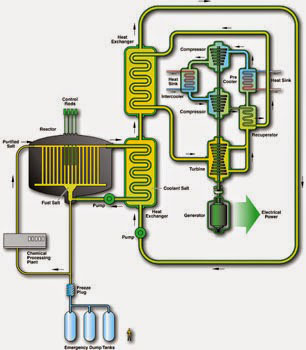 Another scenario is continuous reprocessing of molten salt fuel to remove protactinium and uranium from thorium. Researchers at Oak Ridge explored the feasibility of online protactinium removal in the Molten Salt Breeder Reactor program. Uranium can then be separated from the protactinium in a second step. Sensible safeguards. Protactinium separations provide a pathway for obtaining highly attractive weapons-grade uranium 233 from thorium fuel cycles. The difficulties of safeguarding commercial spent fuel reprocessing are significant for any type of fuel cycle, and thorium is no exception. Reprocessing creates unique safeguard challenges, particularly in India, which is not a member of the Nuclear Non-Proliferation Treaty. There is little to be gained by calling thorium fuel cycles intrinsically proliferation-resistant. The best way to realize nuclear power from thorium fuel cycles is to acknowledge their unique proliferation vulnerabilities, and to adequately safeguard them against theft and misuse. Nigel Marks, Associate Professor of Physics, Curtin University March 2, 2015 “…….. a growing community of devotees has sprung up around an alternative nuclear fuel: thorium. …… Today, advocates of thorium typically point to a variety of advantages over uranium. These include fail-safe reactor operation, because most thorium reactor designs are incapable of an explosion or meltdown, as was seen at Chernobyl or Fukushima. Another is resistance to weapons proliferation, because thorium reactors create byproducts that make the fuel unsuitable for use in nuclear weapons.Other advantages include greater abundance of natural reserves of thorium, less radioactive waste and higher utilisation of fuel in thorium reactors. 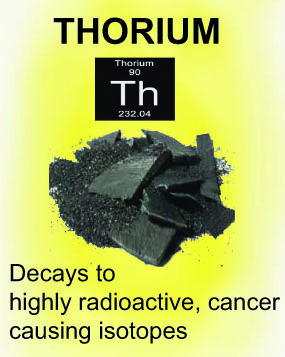 Thorium is often cast as “good nuclear”, while uranium gets to carry the can as “bad nuclear”. Chile’s lithium – blessing or curse?, DW, 11 May 18 Salar de Atacama is rich in lithium, essential to electric cars and other low-carbon tech. But indigenous people are fighting its extraction, saying private interests are cashing in at the expense of their environment. The Salar de Atacama’s geysers, volcanoes and flamingos attract tourists from around the world. But beneath its dramatic vistas, the Chilean salt flats hide something of far greater economic potential that’s drawing a different kind of interest – from the world’s chemical companies. Lithium batteries are essential to all kinds of gadgets from laptops and mobile phones to the electric cars and power storage facilities that are to help wean the world of fossil fuels. As the world shifts to renewables, more and more sectors are to be electrified, and demand for lithium is expected to double by 2025. Salar de Atacama contains some of the world’s richest lithium deposits. Which means Chile is sitting on a goldmine. But exploiting it could come at a terrible environmental cost, protestors say. The Chilean government wants to boost lithium production and potentially manufacture batteries in the country, breaking classic supply model where Latin American countries provide materials for products produced elsewhere. To this end, it signed over lithium concessions to Chilean mining company SQM in January – a deal that’s to see extraction triple by 2030. But environmentalists and mining unions are outraged. “For us, the contract is illegal,” said Miguel Soto, chairman of the Lithium for Chile movement that organized demonstrations against it on the streets of Santiago de Chile. ……….The full extent of environmental damage mining operations could have is still unclear. Domingo Ruiz, a chemist at the University of Santiago who works on lithium-ion technology, says the government should make an environmental impact study and adopt regulations. Radioactive jewellery recalled in Switzerland swissinfo, 7 May 18 A Swiss company has sold esoteric “negative-ion” jewellery containing high levels of uranium and thorium. The Federal Office of Public Health has written to people who have bought the jewellery, telling them to send it to the health office. Health office spokesman Daniel Dauwalder on Monday confirmed media reports that an unnamed company had imported rock powder from China with levels of the two radioactive substances that were harmful for skin cells and the outer skin layer. The health office said if the bracelets, necklaces and earrings were worn for several hours a day over a year, the skin’s dose threshold of 50 millisieverts could be exceeded. In the long term, the risk of skin cancer would increase, it added. ….The radioactive rock powder was discovered by German customs guards, who informed the Federal Office of Public Health. https://www.ucsusa.org/sites/default/files/legacy/assets/documents/nuclear_power/thorium-reactors-statement.pdf Some people advocate the use of thorium to fuel nuclear power plants. Thorium could be used in a variety of different types of reactors, including conventional light-water reactors, which are the type used in the United States. However, thorium cannot be used by itself to sustain a nuclear chain reaction: it must be used together with a fissile material such as enriched uranium, uranium-233, or plutonium. Some people believe that liquid fluoride thorium reactors, which would use a high-temperature liquid fuel made of molten salt, would be significantly safer than current-generation reactors. However, such reactors have major flaws. There are serious safety issues associated with the retention of fission products in the fuel, and it is not clear these problems can be effectively resolved. Such reactors also present proliferation and nuclear terrorism risks because they involve the continuous separation, or “reprocessing,” of the fuel to remove fission products and to efficiently produce U-233, which is a nuclear weapon-usable material. Moreover, disposal of the used fuel has turned out to be a major challenge. Stabilization and disposal of the remains of the very small “Molten Salt Reactor Experiment” that operated at Oak Ridge National Laboratory in the 1960s has turned into the most technically challenging cleanup problem that Oak Ridge has faced, and the site has still not been cleaned up. News articles about Thorium Power (NASDAQ:LTBR) have been trending positive this week, according to Accern Sentiment. The research group identifies negative and positive press coverage by reviewing more than twenty million news and blog sources. Accern ranks coverage of publicly-traded companies on a scale of -1 to 1, with scores nearest to one being the most favorable. Thorium Power earned a media sentiment score of 0.25 on Accern’s scale. Accern also assigned news coverage about the energy company an impact score of 45.422705335828 out of 100, meaning that recent press coverage is somewhat unlikely to have an effect on the stock’s share price in the next several days. LTBR stock opened at $1.15 on Tuesday. Thorium Power has a 12-month low of $0.94 and a 12-month high of $4.80. From the air it looks like a huge lake, fed by many tributaries, but on the ground it turns out to be a murky expanse of water, in which no fish or algae can survive. The shore is coated with a black crust, so thick you can walk on it. Into this huge, 10 sq km tailings pond nearby factories discharge water loaded with chemicals used to process the 17 most sought after minerals in the world, collectively known as rare earths. The town of Baotou, in Inner Mongolia, is the largest Chinese source of these strategic elements, essential to advanced technology, from smartphones to GPS receivers, but also to wind farms and, above all, electric cars. The minerals are mined at Bayan Obo, 120km farther north, then brought to Baotou for processing. The concentration of rare earths in the ore is very low, so they must be separated and purified, using hydro-metallurgical techniques and acid baths. Chinaaccounts for 97% of global output of these precious substances, with two-thirds produced in Baotou. The foul waters of the tailings pond contain all sorts of toxic chemicals, but also radioactive elements such as thorium which, if ingested, cause cancers of the pancreas and lungs, and leukaemia. “Before the factories were built, there were just fields here as far as the eye can see. In the place of this radioactive sludge, there were watermelons, aubergines and tomatoes,” says Li Guirong with a sigh. It was in 1958 – when he was 10 – that a state-owned concern, the Baotou Iron and Steel company (Baogang), started producing rare-earth minerals. The lake appeared at that time. “To begin with we didn’t notice the pollution it was causing. How could we have known?” As secretary general of the local branch of the Communist party, he is one of the few residents who dares to speak out. Towards the end of the 1980s, Li explains, crops in nearby villages started to fail: “Plants grew badly. They would flower all right, but sometimes there was no fruit or they were small or smelt awful.” Ten years later the villagers had to accept that vegetables simply would not grow any longer. In the village of Xinguang Sancun – much as in all those near the Baotou factories – farmers let some fields run wild and stopped planting anything but wheat and corn. A study by the municipal environmental protection agency showed that rare-earth minerals were the source of their problems. The minerals themselves caused pollution, but also the dozens of new factories that had sprung up around the processing facilities and a fossil-fuel power station feeding Baotou’s new industrial fabric. Residents of what was now known as the “rare-earth capital of the world” were inhaling solvent vapour, particularly sulphuric acid, as well as coal dust, clearly visible in the air between houses. Now the soil and groundwater are saturated with toxic substances. Five years ago Li had to get rid of his sick pigs, the last survivors of a collection of cows, horses, chickens and goats, killed off by the toxins. The farmers have moved away. Most of the small brick houses in Xinguang Sancun, huddling close to one another, are going to rack and ruin. In just 10 years the population has dropped from 2,000 to 300 people. Lu Yongqing, 56, was one of the first to go. “I couldn’t feed my family any longer,” he says. He tried his luck at Baotou, working as a mason, then carrying bricks in a factory, finally resorting to selling vegetables at local markets, with odd jobs on the side. Registered as farmers in their identity papers, the refugees from Xinguang Sancun are treated as second-class citizens and mercilessly exploited. By maintaining the pressure, the villagers have obtained the promise of financial compensation, as yet only partly fulfilled. There has been talk of new housing, too. Neatly arranged tower blocks have gone up a few kilometres west of their homes. They were funded by compensation paid by Baogang to the local government. But the buildings stand empty. The government is demanding that the villagers buy the right to occupy their flat, but they will not be able to pass it on to their children. Some tried to sell waste from the pond, which still has a high rare-earth content, to reprocessing plants. The sludge fetched about $300 a tonne. But the central government has recently deprived them of even this resource. One of their number is on trial and may incur a 10-year prison sentence.